Excited Mommy finally able to bring my little Eleanor home! Last Saturday (December 8th), we made the three hour drive to Kempton, IN to bring our little darling home! I even made Gregory get up at 4:30AM so we could get there and home while we still had daylight to show her her big back yard. Up until the day we took her home she had never been in the outside world and like most puppies she is SUPER curious about EVERYTHING and loves to pick up anything and everything she can. 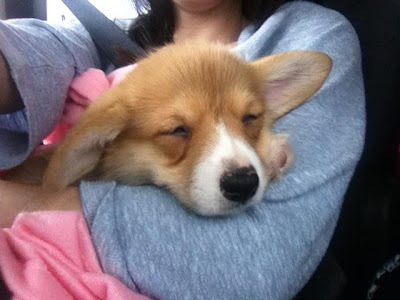 She did wonderful in the car and napped and snuggled most of it. She's done a lot of funny and interesting things that I have been documenting on her personal Tumblr page as I'm sure most of you would be ready to strangle me after a few days and the millions of pictures I'd undoubtedly would be posting! Last count on my Facebook with her picture count was well over the 200 range! (What can I say? 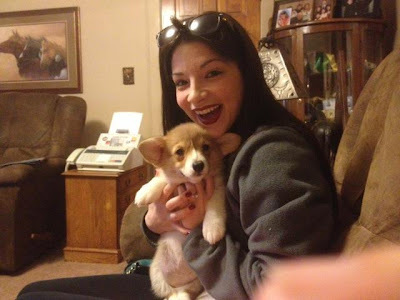 I'm a happy picture crazed mommy) But for those of you who want to follow in the picture crazy you can check it out at Eleanor The Corgi. Her first week home has been definitely eventful! In the six months we've owned our home we've never had some many people come over! Everyone wanted to get a look at our little Eleanor and to be honest I can't say I blame them I mean look at how darling she is!! We've learned come & she almost has sit down! She figured out how to get up the stairs. She had her first vet visit where we learned she weighs 7.6 lbs! We did find out she has a hernia (poor thing) but will more than likely grow out of it. However if she doesn't when we get her spayed they can fix that as well. We took her to the vet thinking she had a grass allergy but the vet cleared our concious of that. We found out the culprit today (in her poop...gross, I know). Poor thing has round worms and they are irritating her when she goes potty. Luckily we gave her her heart worm on the 14th and three treatments of deworming medicine and she's okay! Apparently round worms are very common in puppies but I'm enough of a crazy mommy to have panicked and called the ER vet after searching forums & Google. 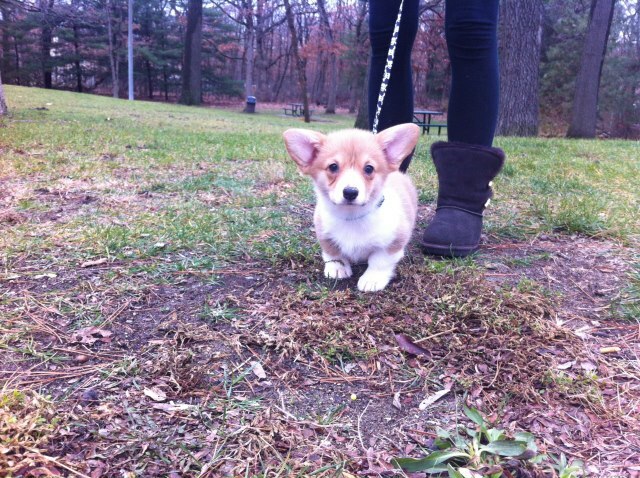 But a friend who's had corgi's in her past informed me with was common and we are on the end of the problem. So that made me feel a LOT better! NOM NOM NOM I love raw hides! Hope you all have a wonderful and relaxing sunday!